October Has Come, Rock and Shock Looms! As your local shops fill up with skeletons, vampires and friendly ghouls to hang about your house, our thoughts turn to Halloween, and for folks dedicated to all things horror, that includes planning their annual trip to the biggest horror and music convention on the East Coast during the spookiest of seasons; ROCK AND SHOCK! October 16th through 18th, Rock and Shock will celebrate their 12th year of music and mayhem at Worcester, MA’s DCU Center with a full schedule filled with panels, film screenings, activities and contests running across a show floor jam packed with excellent guests and awesome vendors. You’ll find all the holiday gifts you need for the creepiest kids in your life! This year’s guest lineup includes George Romero, Godfather of Zombies everywhere (and director of Night of the Living Dead if we need to mention that), Tobin Bell (SAW Films), Naomi Grossman (American Horror Story), William Sanderson (Blade Runner, True Blood), Samantha Mathis (The Strain, American Psycho, Pump Up The Volume), Adam Green, Bill Moseley, William Forsythe, Doug Bradley, PJ Soles and more! Check out the full lineup HERE! This years’ bands include Danzig, Hatebreed, Twiztid, Prong, Soulfly, Soil Work, Blaze, Witch Mountain, Sanctuary, Superjoint and many more! Part of the “many more” is a special addition you’ll find only at Rock and Shock. Last year, primo photographer Jeremy Saffer presented to us THE ROCKING DEAD. Last year, primo photographer Jeremy Saffer presented to us The Rocking Dead. A band of music’s finest was assembled from acts that were on the Rock and Shock bill as well as surprise special guests, and with a mere soundcheck as their only practice as a unit they took the stage and belted out a set of classic Misfits songs. When they were done the fans knew they had seen something truly special, and in many a mind there grew hopes that this rare assembly would return. Well, their voices were heard, and Jeremy Saffer will once again present The Rocking Dead to you this year! But this time, the monster has grown! Led by musical director, protector of animals and rock and roll guitarist extraordinaire Ace Von Johnson, a band has been assembled that brings back many of last year’s gang but, like any good sequel, this one is even bigger! As icing on the cake, many of the players will be signing during the convention! (Note: some will be signing all three days but due to touring schedules some will only be able to sign on Saturday.) As for the performance, what bands and songs will they cover this year? Will there be surprise guests? Well, some secrets are better kept until the show, but with The Rocking Dead added to an already stacked Saturday concert lineup this is an event not to be missed! Check out the full music lineup HERE! We’ve got three days of films rolling out as well, including Chainsaw Maidens, Old 37, Fury, Diary of a Deadbeat, Pieces of Talent, plenty of shorts and some surprise features! After cruising the show floor to shop with an incredible array of vendors, you can take in programming where amazing folks from the horror industry share their secrets with you, visit the Rock and Shock Creative Lair and learn drawing, writing, mask casting, creative activities and more, wave hello to super talented cosplayers roaming the floor or join them in our Cosplay Contest (for little AND big kids!) sponsored by Halloween Outlet and swing by the Idle Hands booth to test your horror knowledge or accept a challenge, all for killer prizes! While every day at Rock and Shock provides a kid friendly atmosphere families will love, Sunday is KID’S DAY with a schedule including face painting, pumpkin decorating, a coloring contest and a cosplay contest just for your little monsters. We also show our appreciation for our servicemen on Sunday by offering FREE ADMISSION to all Police, Fire, EMT and Military personnel. Just show your service ID at the doors and you can receive up to 4 free tickets to the convention! Rock and Shock is a three day horror and music convention featuring celebrity signings, movie screenings, concerts, panels and more. 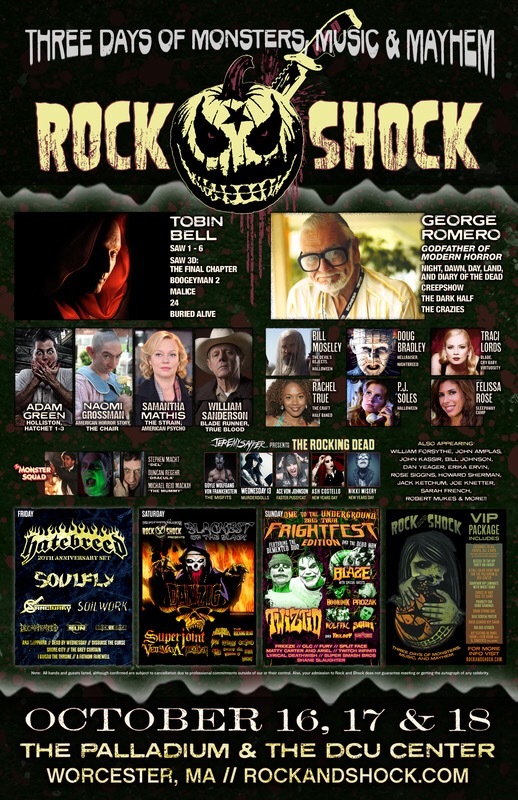 Now in its 12th year, Rock & Shock has played host some of the biggest names in horror and rock. This year’s event will be taking place October 16-18, 2015 in downtown Worcester, Massachusetts at the DCU Center (http://www.dcucenter.com) and the Worcester Palladium (http://thepalladium.net). Massachusetts prepares for the 10th anniversary of the Rock and Shock Horror and Music convention series this weekend (October 18th – 20th) with a lineup of sinister guests, musical acts and events that cannot be missed! This year’s celebrity guests include Robert Englund (Freddy Krueger of Nightmare on Elm Street), Robert Patrick (Terminator 2, The X-Files), Gunnar Hansen (Texas Chainsaw Massacre), Michael Rooker, Scott Wilson, Lew Temple and IronE Singleton (of The Walking Dead), cast and crew from Sharknado, the cast of Holliston and many more! Nightly entertainment kicks off with a pre-show Thursday performance from Between the Buried and Me with The Faceless, The Contortionist and The Safety Fire. Friday brings a double feature of Kevin Smith’s Red State and Jay and Silent Bob’s Super Groovy Cartoon Movie. Saturday we welcome Danzig’s 25th Anniversary Tour with special guest Doyle, Otep, Butcher Babies, Texas Hippie Coalition, A Pale Horse Named Death, New Years Day and more. Sunday rounds out the weekend with Twiztid’s Fright Fest including Blaze, The Roc, Aqualeo, Funny People Makin’ Funna People, Fury, Masstapeace, Outland Camp, Wayne Da Payne and more! Rock and Shock’s show floor offers so much more than awesome celebrity guests and isle after isle of incredible vendors. Rock and Shock offers a family friendly environment with lots for kids to do! Tickets are available now at http://rockandshock.com/tickets/ with options from VIP to show attendee. Worcester, Massachusetts on Friday, October 18 and Saturday, October 19. Meteorologists can confirm that Sharknado‘s director Anthony C. Ferrante (Sharknado, Boo, Hansel & Gretel, Headless Horseman) and star Jason Simmons – (Sharknado, Bloody Mary, Nowhere, Baywatch) will be making landfall directly inside the DCU Center as part of Rock & Shock 2013. All residents are advised to take proper precautions by purchasing their tickets at rockandshock.com. It’s the movie that caused a social media sensation like no other, and now you have the chance to meet the men behind this contemporary classic; director Anthony C. Ferrante and actor Jason Simmons. Making their first convention appearance ever and hot off the tails of the Sharknado sequel announcement, Ferrante and Simmons will be signing autographs and meeting with fans as part of the 10th annual convention. Also joining Ferrante and Simmons will be Robert Englund (Nightmare on Elm Street, Hatchet), Robert Patrick (Terminator 2: Judgment Day, The X-Files), The Walking Dead’s Michael Rooker and Scott Wilson and many more. Live performances include, Kevin Smith and Jason Mewes (Jay and Silent Bob’s Super Groovy Cartoon Movie and Podcast Q&A), Danzig with special guest Doyle and Twiztid. For a complete list of attendees and up-to-the-minute announcements, please visit http://www.rockandshock.com. MassConcerts is pleased to announce that Kevin Smith and Jason Mewes, Danzig and Twiztid, along with a myriad of very special guests, will be taking the Worcester Palladium stage as part of the 10th annual Rock & Shock event! On Friday, October 18, Kevin Smith and Jason Mewes will be bring their famed characters Jay and Silent Bob, to Rock & Shock with a viewing of their new animated film – Jay and Silent Bob’s Super Groovy Cartoon Movie. Having brought the characters to life in several of Smith’s renowned films such as Clerks, Mallrats and Dogma, the legendary best buds from Jersey are back to dispense weed and wisdom, this time in cartoon form. Audiences will have the opportunity to watch the new movie with its stars and then participate in rip-roaring Q&A and podcast recording afterwards. Both general admission and VIP tickets will be available for this event. On Saturday, October 19, legendary rockers Danzig will continue celebrating the 25th anniversary of their 1988 debut album, Danzig, with a performance at Rock & Shock. Danzig’s former Misfits bandmate Doyle Wolfgang von Frankenstein will be joining him as well as special guests Otep, Butcher Babies, Texas Hippie Coalition, Stolen Babies, New Years Day and A Pale Horse Named Death. Sunday, October 20, the convention wraps up when the terrifying twosome Twiztid take the stage alongside Blaze, Madchild and Aqualeo. Bringing along their patented brand of sinister, painted faces and wicked lyrics, the horror-core rap group will wrap up this year’s festivities with what is guaranteed to be an unforgettable performance. Tickets for both the convention and the live performances will go on sale this Friday at 10am through the Palladium box office, tickets.com and select FYE stores, while convention only tickets will be available at Ticketmaster, and both the DCU Center and Palladium box offices. For complete event and ticket details, visit http://www.rockandshock.com. Previously announced Rock & Shock 2013 guests include Robert Englund (Nightmare on Elm Street, Hatchet), Robert Patrick (Terminator 2: Judgment Day, The X-Files), Michael Rooker (The Walking Dead, Henry: Portrait of a Serial Killer), John Ratzenberger (Cheers, Motel Hell), Katharine Isabelle (Ginger Snaps, American Mary), Jordan Ladd (Cabin Fever, Death Proof), Lew Temple (The Devil’s Rejects, The Walking Dead) and IronE Singleton (The Walking Dead) . Rock and Shock is a three day horror and music convention featuring celebrity signings, movie screenings, vendors, concerts, panels and more. Now in its tenth year, Rock & Shock has played host some of the biggest names in horror and rock. This year’s event will be taking place October 18-20, 2013 in downtown Worcester, Massachusetts at the DCU Center (http://www.dcucenter.com) and The Worcester Palladium (http://thepalladium.net). Tickets are available online at http://www.rockandshock.com.